Jim Larson will retire at the end of July, 2018. 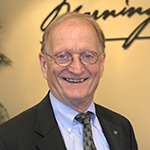 Jim Larson, long-time President / CEO of Morningside Services, will retire at the end of July, 2018. Mr. Larson announced his intention to retire three years ago. At that time, the Board of Trustees brought on former Morningside Vice President Development Jonathan Pleger as an executive vice-president to oversee planning, development and other operations prior to his anticipated appointment as CEO in August. Larson, the organization’s longest serving President/CEO, joined Morningside as its fourth president in 1989. He took over leadership of the nonprofit after a successful 13-year career that included previous CEO roles at similar organizations in McMinnville, Oregon and Ellensburg, Washington. During his presidency, the organization transformed from a sheltered workshop where individuals with disabilities worked in a segregated setting to an agency that supports individuals working in individual jobs in the community. Larson is highly respected by the community and staff alike. In December, he was named by the Thurston County Chamber of Commerce as Boss of the Year. Michael Cade, Morningside Board member and Executive Director of the Thurston County Economic Development Council, says “Jim’s vision and passion for serving individuals with disabilities has changed the Morningside organization in ways that benefit not just their clients, but the entire community. He has been a champion for equal pay for equal work, and has a long list of impressive achievements. His leadership will be missed, however, he has created a strong and professional organization that will continue to serve and support greatly those individuals with meaningful work and employment opportunities. The entire Board of Directors is grateful for his work, dedication and vision. Since 1963 Morningside Services has been helping change the lives of individuals with disabilities by matching their skill and interest with jobs in the community. Morningside is one of the nation’s most successful programs for matching individuals having significant disabilities with jobs in the community. Last year they served 1,028 individuals in five counties in southwestern Washington.